The best Google Analytics App available for the iPhone right now is in my opinion without a doubt (and simply named) Analytics App. 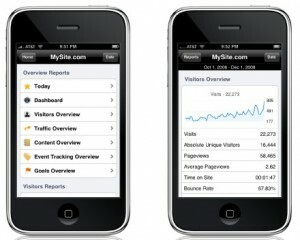 Analytics App gives you complete mobile access to your Google Analytics data from your iPhone. Whether you have just one site profile and one Google Analytics (GA) account, or multiple accounts with multiple profiles, this iPhone app is something I believe you will really be happy with. For the past two months I have been using Analytics App at least a couple times per day, be it to answer questions on the go for others (i.e. HiPPOS) or even just simply playing around with it for fun to satisfy curiosities. It’s intuitively easy to use with virtually no learning curve for the app itself. Basically just click and there’s your data. I wouldn’t use this for actual data analysis (and this in part because of the limitations of the iPhone itself) but it’s extremely handy and fun to be able to have on the go with you. Before I purchased it though, I thought it might be difficult to view analytics data on the iPhone due to the screen size, but the interface fits the iPhone perfectly and the data surprisingly is extremely easy to view with no straining on the eyes, even the charts it displays are easy to view. Quick access Dashboard for Today’s data. Plus, more than 30 detailed reports you can view by drilling down in each of the areas, for example Keywords, Visitor Loyalty, Top Landing Pages, Top Content, Event Actions, and the ability to view your Custom Reports that have already set up inside your Google Analytics account. Unfortunately, and unless I am missing something, you can’t click on individual referring sites themselves to view them in the iPhone browser. And, URL’s are limited to 22 characters so in the Top Content Reports you’re not able see the entire URLS or click on them either, so if your URL’s are long and non-intuitive before the 22 characters are used up you may not be able to know which URL is being referred to (but you can always use the Content by Title report). I should note, that to view multiple accounts with Analytics App you’ll need to give access for one account to view the others – but this has to be done on GA website itself, or you do it the old fashioned way by logging-out and then log back in on the app for each account itself if you want to view different accounts (I want to emphasize this is for accounts, not profiles as all profiles under your account are visible and selectable when you launch the app). Security: Analytics App stores your GA username and password information locally on your iPhone for security reasons. Date Ranges: I found that setting the dates to view your data for is actually easier than in Google Analytics using the standard iPhone scroll wheel (and setting it in GA is easy). What impressed me the most before I purchased it was that not that it was only $5.99, or that its reviews were overall rather fantastic, but that they offered a money back guarantee via PayPal so I felt that the risk was minimal. I’ve purchased many apps that have left me disappointed, so this was a motivating factor to purchase it on the spot without further consideration. So with nothing to lose (your money that is), I would definitely recommend checking the Analytics App out, or if you know someone who already has it to try theirs out – you’ll be glad you did, the app itself is really well produced.